Dill is a well-known culinary herb that also carries different medicinal properties. Explore more about its ancient origins and many uses. Dill, an herb originating in Eastern Europe and the Mediterranean, has been widely-used spice for millennia. It is believed be a native of the widespread area between Western Russia and Northeastern Africa, and to have been domesticated first near the Russian steppes over 2,000 years ago. This early popularity of dill for the dual reasons of medicinal and culinary purposes allowed its popularity to spread throughout the world and remain a widely-consumed herb. Relieving stomach cramps. Dill has the ability to suppress muscle spasms and therefore soothe an irritated stomach. Treating flatulence. Dill has historically been used to minimize wind in the human body. There is evidence that now exists to support this. Supporting the immune system. The antioxidant compounds and other nutrients in dill can help the body to build defenses against bacteria and viruses. Additionally, preliminary research suggests that dill may contribute to reducing cholesterol levels, although more studies are needed to confirm this alleged benefit. 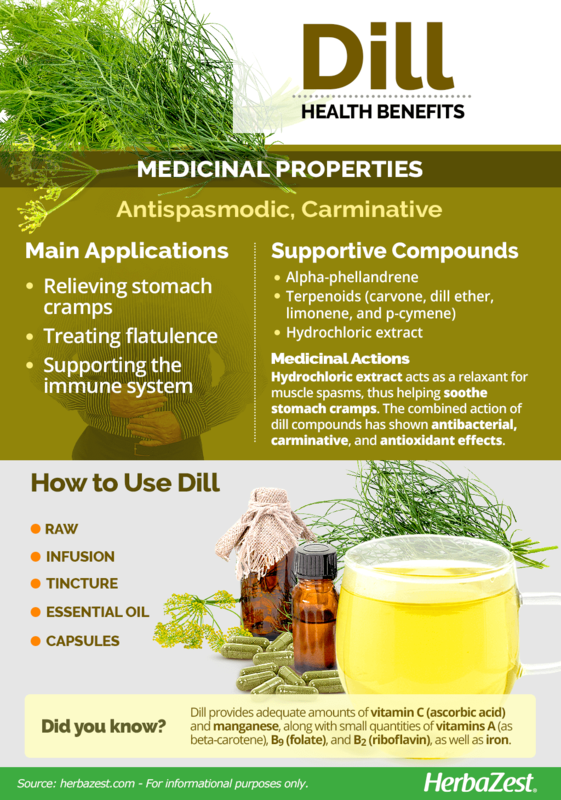 Traditionally, dill has been used for treating colic, insomnia, urinary complaints, and piles. Over 36 components have been identified in dill; however, α-phellandrene is its dominant compound and amounts to 53% of the herb's oil; it is also the main compound responsible for the pleasing aroma of the plant. Other terpenoids - such as carvone, dill ether, limonene, and p-cymene - are also major constituents of dill oil, which is extracted from the herb's leaves and seeds. Though the exact mechanism of each component has not yet been established, the combined action of these chemicals has shown antibacterial, carminative, and antioxidant effects. Dill extracts have also been found to possess antihyperlipidemic agents, which help reduce fatty compounds that cause high cholesterol. The seeds of the plant contain a hydrochloric extract, which acts as a relaxant for muscle spasms. This can be helpful in treating stomach cramps. Guelder rose and linden are examples of herbs with strong antispasmodic properties, and similar carminative benefits can be found in cardamom and fennel. Dill is generally considered safe to be ingested, as well as for topical use. However, it may cause skin irritation and heightened photo-sensitivity in sensitive people. This means that extra care should be taken if one is going to be in the sunlight. Women who are pregnant or breastfeeding should seek advice from a health professional before regular intake of dill. Allergic reactions to dill are uncommon, but can occur, particularly in those who are allergic to coriander, fennel, aniseed, caraway, asafetida, or celery. People with hypoglycemia and diabetics taking medication should be aware that consuming dill can lower blood sugar levels. 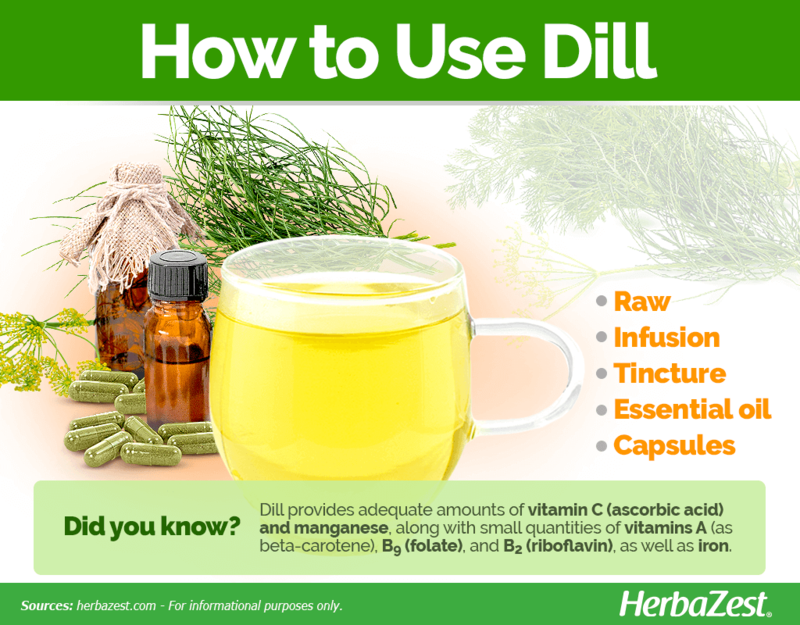 Since dill is an aromatic herb, used mostly to lend a fresh, aniselike flavor to culinary dishes and beverages, it doesn't provide a great deal of nutrients per serving; however, it contains adequate amounts of vitamin C (ascorbic acid) and manganese, along with small quantities of many important nutrients, such as vitamin A (as beta-carotene), B9 (folate), and B2 (riboflavin), as well as iron. Dill sprigs also provide many other vitamins and minerals in trace amounts; however, all these elements contribute to sustain a functional immune system and a general good health. 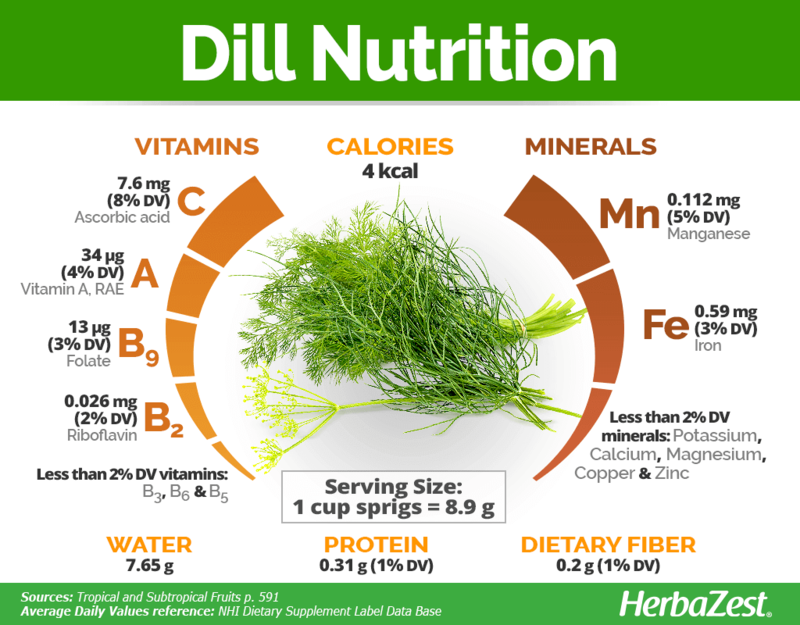 One cup of dill sprigs (about 9 g) provides 4 calories, as well as 1% of the daily value for protein and dietary fiber. Dill boasts a unique taste that can make many dishes more interesting. This aromatic herb is especially favored in Russia, where it is used in a large proportion of cuisine. It can be consumed as a fresh or dried herb, or it is also available in the form of tea, as well as in a range of health supplements. Dill has been used as a flavoring for vodka and meringue. Raw. Dill has a distinct anise-like, sweet, and citrusy flavor that many enjoy and add to a vast range of culinary preparations, such as sauces and dressings. 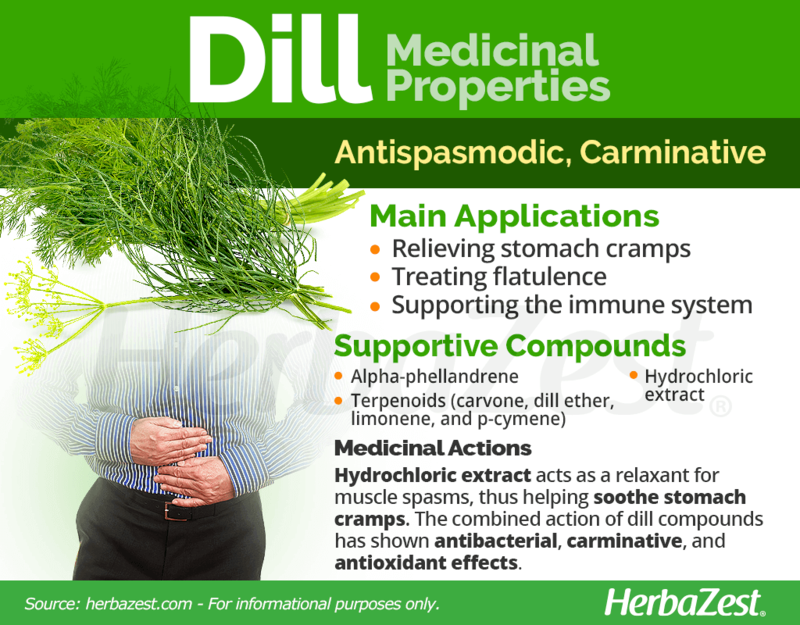 When consumed with food, dill provides carminative benefits. Infusion. Fresh or dried, the whole plant can be brewed into a warm herbal tea. This preparation can soothe digestive complaints. Tincture. This concentrated form of dill is a convenient method of reaping the herb's medicinal benefits and should be diluted in water. Essential oil. Generally extracted from the seeds, it is also possible to be obtained from the leaves and stems. Dill's essential oil is often used as a relaxant. It can be applied topically or added to food. Capsules. These may be preferred because they permit a fast intake, easy dosage adjustment, and a consistent concentration of dill's active ingredients. Raw dill is easy to find at most grocery stores and local markets around the world. The most common presentations of raw dill include the dried leaves and seeds, which are sold as herbs and spices. Many supermarkets and plant nurseries now even sell dill seedlings, because adding fresh dill to a vast amount of foods has become so popular. Whether bulk or in tea bags, dried dill is available to buy online and at health food shops. Tinctures, capsules, and essential oils can be found at specialized health stores, and a range of supplements are also available for purchase online through herbalist and specialized health retailers. These preparations are likely to differ in concentration, so it is important to do some previous research and read the labels carefully in order to consume the appropriate dosage. Dill is frequently grown in gardens, not only for harvest of its aromatic leaves and seeds, but also for its ornamental foliage and its pretty, unassuming flowers. It can be grown as an annual or perennial plant, depending on the surrounding conditions. Dill is a hardy, fairly adaptable plant and tolerates poor soil conditions; however, it grows best in well-drained, sandy or loamy soil, with an ideal pH of 5.8 - 6.5. Dill needs hot summers, plenty of sunlight, and protection from strong winds and frost in order to be grown as a perennial. Dill tolerates cold winters and can survive temperatures as low as 25°F (-4°C), but an ideal temperature range to grow this herb is 43 - 79°F (6 - 26°C). Regular watering is required; however, care should be taken not to over-water it, since this is likely to cause rotting. Seeds should be planted directly in garden soil or containers, 1/4 inch (6 mm) deep and around six inches (15 cm) apart. Leaves will be ready to be harvested within two months of planting. Some manual weed control is advised, and a layer of mulch on the soil is recommended. Dill attracts many beneficial insects, such as bees and butterflies, but it is also susceptible to aphid infestations and diseases like powdery mildew. When it is cultivated in the optimum conditions, dill can grow up to 35 inches (90 cm) tall. It consists of tall, slender stems that split into four or five, and then from these develop further, short stems with feather-like leaves on them. Flowers will develop in the summer as clusters of yellow spheres known as schizocarps. Schizocarps will dry and split, becoming seeds. Dill (Anethum graveolens), is a member of the large Apiaceae group, commonly known as the carrot or parsley family, which contains 3,700 species across 434 genera. Most of its members are aromatic flowering herbs and slow-growing, woody perennials called shrublets. Apiaceae contains a large number of other economically-important species, including celery (Apium graveolens), anise (Pimpinella anisum), and coriander (Coriandrum sativum). 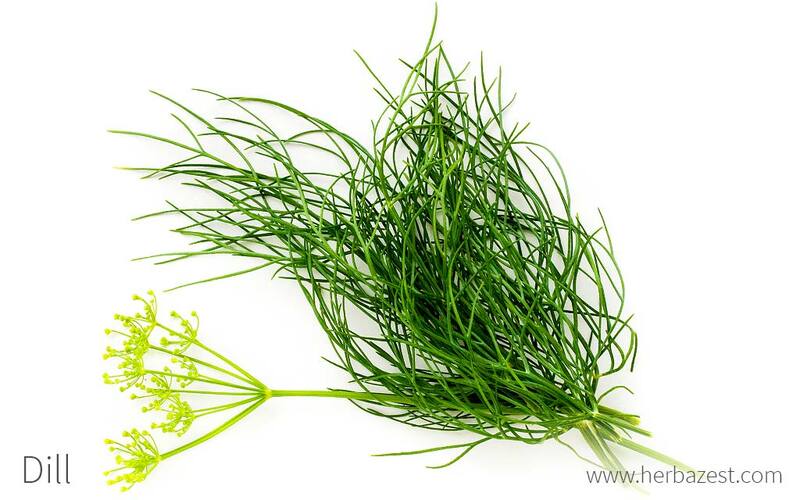 Although dill is the sole member of the Anethum genus, over the course of history, many different cultivars of dill have been developed for commercial purposes. The most common is 'bouquet', which has aromatic, dark blue-green foliage and big seed heads. Other popular cultivars are 'Long Island', 'fernleaf', 'dukat', and 'superdukat'. It is known that dill was highly valued in ancient eras because it earned mentions in both Egyptian and Christian literature. Sprigs of dill were discovered in the tomb of Egyptian Pharaoh Amenhotep II, who died in 1400 BCE. Traces have also been found among Roman ruins in Great Britain. Dill was a symbol of wealth in ancient Greece and Rome. The Greek physician Hippocrates was known to have valued it for its cleansing powers, and soldiers of the time would use it to treat burns. The genus name Anethum is derived from aneeson, a Greek word meaning strong smelling, and the name dill is thought to come from the Norwegian word dill (to lull), referring to the carminative properties of the herb. Dill is considered an economically-important herb. Currently, India and Pakistan are its biggest producers, although the United States, Europe, and North Africa also cultivate it on a large scale. The U.S. and Russia are the biggest importers of the herb. The International Trade Centre has carried out a survey and estimated that the annual demand for freeze-dried dill is around 300 tons for France, Germany, Britain, and the Netherlands alone. It was also once thought that dill could stimulate the flow of milk in lactation, and so it was administered to women and cattle who were having difficulties nursing. Pest control. Dill has proven to be an effective pesticide, particularly when it is crossed with coriander. The substance obtained is toxic to some larvae and pests that appear in wheat flour. Food industry. Dill extracts can also be used in some preservatives, as the compounds of the herb inhibit the growth of certain bacteria, including Staphylococcus, Streptococcus, Escherichia coli, and Pseudomonas. Cosmetics. Dill essential oil can be found in some soaps, moisturizers, and lip balms. It has also been used in the production of perfumes due to its agreeable scent. Dill remains a very popular herb because of its pleasant flavor and versatility. The wide range of health benefits that it offers, along with its mainstream culinary uses, confirms the herb's position as a highly-regarded plant, which is likely to continue being widely cultivated across the world.